Dose the right amount of coffee, it should be close to 21g. See this link. Distribute your dosed coffee. No amount of beard grooming will make up for poorly-groomed coffee. Make sure it is flat and evenly spread out in your basket. We’re always improving how we do this, but we’re finding tilting the handle and giving a few gentle lateral taps will shift the coffee round and fill any gaps in the basket. This even distribution will decrease the chance of channelling and increase the quality and evenness of your extraction. 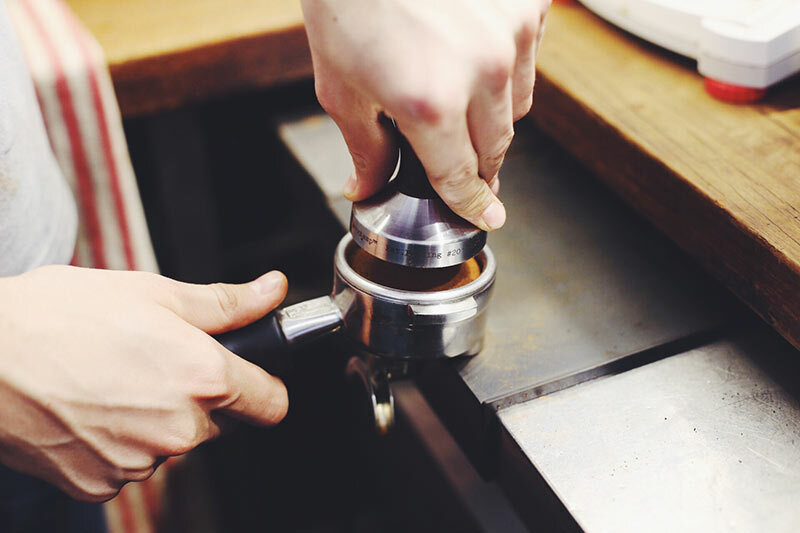 Place your portafilter on a level surface and push down firmly ensuring that your tamp is flat and then release. It’s also important not to not tap the basket with your tamp so you don’t disturb the tight and tidy bundle that you have just created. It’s also important not to get your twist on, this can lead to a shift in weight distribution on the puck and throw your level out without you realising. If you choose to polish do it without applying any pressure. Save your twisting for the dance floor! Wipe the top of basket so that it’s nice and clean before you load it into the group. Now get that portafilter into the group head and press go. If coffee doesn’t flow from both spouts at the same time you have not tamped flat. Rarely does such a thing happen to experienced baristas working with our coffee, but we all have our off tamps. Hopefully rather, you’ve got a nice steady and even flow out of both spouts. Then the challenge is to repeat it, shot in, shot out, day in, day out!